The following procedure listed is for the LH side. Immediately wash off any brake fluid that comes into contact with any painted surfaces. (1) Remove the pin hold clip from the 2 front disc brake anti-rattle with hole pins. 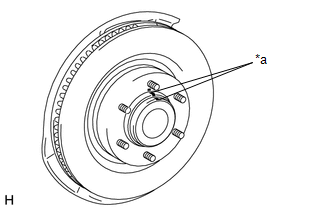 (2) Remove the 2 front disc brake anti-rattle with hole pins from the disc brake cylinder assembly. 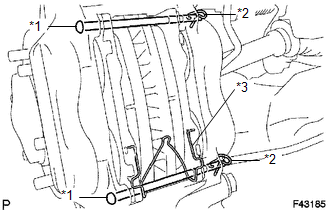 (3) Remove the anti-rattle spring from the front disc brake pad. 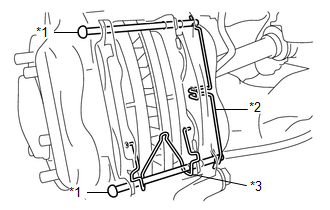 (1) Remove the 2 pin hold clips from the 2 front disc brake anti-rattle with hole pins. 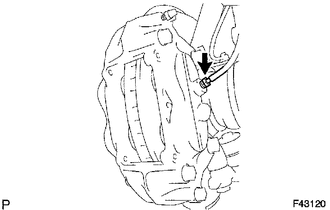 (a) Remove the 2 front disc brake pads with front anti squeal shim from the disc brake cylinder assembly. 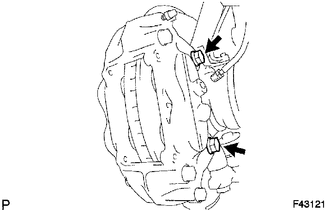 (a) Remove the 2 front anti squeal shims from each of the front disc brake pads. 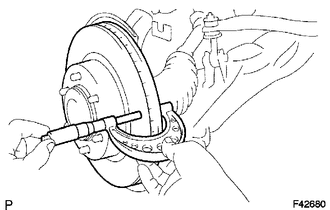 (a) Using a union nut wrench 10 mm, separate the brake tube from the disc brake cylinder assembly. Use a container to collect the brake fluid as it drains out. (b) Remove the 2 bolts and the disc brake cylinder assembly. (a) Using a micrometer, measure the disc thickness. If the disc thickness is less than the minimum, replace the front disc. (a) Place matchmarks on the front disc and the front axle hub and remove the front disc.